On this Giving Tuesday, Vitarock.com understands more than ever that the world’s abundance and resources aren’t distributed fairly. 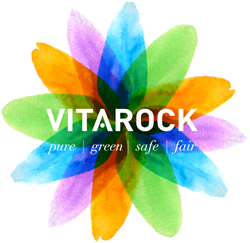 Vitarock.com aspires to change all that —as a natural health products online store with a focus on ethical consumerism. Jamieson Vitamins, a Canadian supplement company, draws on energy derived from one of the largest solar power installations in Ontario, plants trees, promotes initiatives that save water and reduce chemical use, uses eco-friendly cleaning products, donates its used computers to schools and uses only 100% recyclable packaging materials. Andalou Naturals, an American natural beauty care manufacturer, uses a minimum of 70% organic ingredients in its formulations (reducing chemical use in botanical agriculture), has donated hundreds of thousands of dollars to socially responsible projects and negotiates fairly with all its farmer-suppliers. Alaffia Sustainable Skin Care was created to help West African communities become sustainable through the fair trade of indigenous resources. Alaffia actively works to promote community development in Togo, supports gender equality at the community level and is Certified Fair Trade. Genuine Health is a Canadian supplement manufacturer and maker of greens+. Genuine Health is a certified B Corp, and donates 5% of its profits to good causes like the David Suzuki Foundation and Vitamin Angels. The company participates in the Climate Neutral Initiative and is “Bullfrog Powered”, which reduces our reliance on fossil fuels as energy sources. A percentage of every sale made on Vitarock.com is donated to Elephant Thoughts, a Canadian registered charity that improves the lives of children by supporting their personal development, facilitating access to quality education, and improving their communities from a social and ecological standpoint. ALS Canada: The leading not-for-profit organization working nationwide to fund ALS (Lou Gehrig’s disease) research. The Movember Foundation: Committed to changing the face of men’s health. Polish Orphans Charity: Established to help improve the facilities and care of children living in Polish orphanages. Vitamin Angels: Helping at-risk populations gain access to lifesaving vitamins and minerals. Toronto Non-GMO Coalition: Affecting change around Genetically Modified Organism issues. Vitarock.com and its Facebook page have more information on how consumers can support these ethical companies on this Giving Back Tuesday and everyday. This way, everybody wins. Based in Toronto, Canada, Vitarock is an online marketplace featuring 1000s of ethically produced natural products that don’t harm your health or pollute the environment, are made with ingredients that aren’t tested on animals, and contain as many fair trade ingredients as possible. They all adhere to our company pillars of Pure, Green, Safe and Fair.